Draws Venn diagrams showing the intersections of the given sets of identifiers. The required R-package can be downloaded here. You can draw up to four Venn diagrams with 2 to 9 sets in each. The diagrams are displayed as subfigures in one figure. You can refer to the diagrams created by the component in the LaTex document. The figure containing all the diagrams is labeled 'fig:instanceName' and the subfigures for individual diagrams are labeled 'fig:instanceName-i', where instanceName is the name of the variable used for the component in the network definition file and i is 1,2,3 or 4 referring to the specific Venn diagram. If there are NA or duplicated values in the sets they are removed. in SetList Mandatory Sets containing identifiers. report Latex Latex subsection containing the Venn diagrams. out SetList Sets visualized in the Venn diagrams. cexSetName float 0.5 A numerical value giving the amount by which the set names in the plot should be scaled relative to the default values. cexSetSize float 0.5 A numerical value giving the amount by which the sizes of the sets in the plot should be scaled relative to the default values. colorAlgorithm string "" The algorithm used to fill in the colors to Venn diagram. Possible values are "signature", "binary" and "sequential". The default empty string omits the coloring. doWeights boolean true If true, the size of the sets in the figure are weighted by the cardinality of the sets. However, this is not always possible depending on the number of the sets in the diagram and the type parameter. If false, all the sets are represented with the same sized objects. increasingLineWidth boolean false If true, each set is given a different linewidth, with the last to be plotted given the thinnest width, to help in visualising nonsimple Venn diagrams. names1 string "" Names of the sets to be used in the first Venn diagram. Names are given in a comma-separated list and mapped to sets in sets1 positionally. If non are given, the set ID is used as set name. names2 string "" Names of the sets for the second Venn diagram. names3 string "" Names of the sets for the third Venn diagram. names4 string "" Names of the sets for the forth Venn diagram. 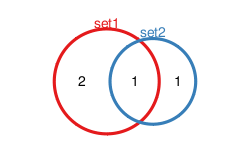 sets1 string (no default) A comma-separated list of minimum of 2 and maximum of 9 sets identified by the set IDs for which the Venn diagram is drawn. sets2 string "" Sets for the second Venn diagram. sets3 string "" Sets for the third Venn diagram. sets4 string "" Sets for the fourth Venn diagram. types string "circles" A comma separated list of types for the Venn diagrams. The first is used with the diagram of sets1 and so on. If there are less types than diagrams to be drawn, the values are recycled. The type defines the shapes of the objects used to represent the sets in the Venn diagrams. Possible types are "circles", "squares", "triangles", "ellipses", "AWFE", "ChowRuskey" and "battle". Note that only a subset of shapes is supported for a diagram with particular number of sets.